After riding our motorcycles through canyons and up and down mountains, I've had friends ask me if I saw that squirrel run out in front of me during a turn, or that deer grazing by the side of the road. And often I'll shake my head, "no". "I was too busy watching the road", I might answer. The eyes, of course, don't actually see. They simply capture the light. It's the brain that assembles the information into an image. It turns out, the light passes through a curtain of blood vessels across our retinas. But we never see the blood vessels because our brain has learned to filter out redundant information. Our ears also pick up the sound of our heartbeats and the rush of blood in our bodies, but our brains filter that out too. Ever wonder why you eventually get used to a bad odor in the room? It's because the brain filters that out also. So the question is, what more are our brains filtering out? The "reality tunnel" is the removed layers of reality necessary to our survival. It's what helps us recognize that lion crouching in the grasses. But in a civilized society, what we perceive as dangerous varies from person to person. It's why there are still white people who are afraid of black people. It's why we call someone an "idiot" for not seeing obvious dangers. One person suffering from PTSD will panic over something that his friends can't understand. Filtering is a defense mechanism. The more comfortable you are with your surroundings, the harder your brain tries to find something dangerous. One person talks at a quiet volume because his brain is filtering a lot of ambient noise. Another person speaks at a higher volume because his brain isn't. The "reality tunnel", as it was coined by Timothy Leary, is the world each of us perceives. Our life's experiences shapes what we perceive as dangerous or insignificant, and our brains filter out layers of reality from there. Introverts might filter more reality, becoming too oblivious to their surroundings. Extroverts might filter less reality, becoming too obsessed with their surroundings. 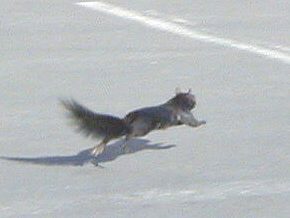 Maybe why I didn't see that squirrel run out in front of me while I was leaning into the curve is because my brain has learned to filter out objects that would put me into panic during critical moments. Maybe the reason why other riders go slower into curves is because they're perceiving dangers that I'm not perceiving. Some would call me a lunatic for riding the way I do, but I like to think of it as being evolved. Which make better motorcycle riders, introverts or extroverts? Is it correct to assume that one who lives the longest and happiest life, filtered out reality effectively? While the eyes take in information the brain decides what to do with that information. When the brain "filters it out" it's deciding what information to share with the cognitive areas and what to process in the background. All the information taken in by the eyes, ears and other senses is still there. It's the mind's ability to process all that information, filter it and react to it a such great speeds that makes motorcycle riders a little smarter than our rideless peers. That being said, who makes better rider, introvert or extroverts? Depends on how you define the labels. Psychologically speaking the labels of intro- and extroverts doesn't describe how social an individual is but rather how an individual is social. Introverts (like myself) tend to think and ponder more than extroverts who will discuss and share more. Personally, I think this gives introverts an advantage since our minds are better prepared for processing information on it's own without the approval or considerations of others. Like you said, I'm less likely to notice things off to the side of the road while I'm riding. I've been told I've not noticed deer, police cars, sand, etc. I'm also a slower rider some of the time. Not because I'm paying attention to the world around me better but because I tend to think things through instead of relying on skills or experiences alone. This applies more so on roads I'm not familiar with but can be applied to roads I ride all the time. Your second last question is interesting. I expect one's personality type would have an influence but damned if I can figure out what it would be. And a related question would be "Are you more inclined to be a biker if you're an extrovert or an introvert?" Something to think about. I've often wondered how much information the eyes can take in at a given moment. When I'm riding, it seems like a great deal. I recently read this; "Nick Herbert in the book Elemental Mind calculates that we process 11 trillion bits of information through the eyes per second." So although we can process that many bits, we probably don't. As you noted, we can "ignore" certain data, given enough practice. As an extrovert, I don't see myself as limited as a rider, nor more proficient. Because of my experiences assessing dangerous situations, I find myself able to take in a great deal of info when I ride and process the challenges quickly; more quickly than I had thought I would be able to. All of those instant calculations and adjustments are exhilarating and stimulate my mind. More and more I find that I'm developing the neuro pathways, helping that information to travel quicker all the time. I believe that is also known as "muscle memory". But as an extrovert, I talk to sort out my thoughts. This is not to seek the approval of others. It is to process on the outside through verbalizing. I take in more information, as well as expel more. I don't think there's a way to calculate how that affects my skills as a rider, but it's interesting to consider. Very interesting perspective, Steve. I do tend to 'zone out" when riding sometimes. I'm so focused on the road I don't see...the road.